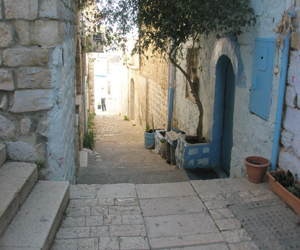 Many people come to Tzfat for the Old City experience. The synagogues, galleries, lanes and alleys beckon them, and that's the atmosphere that they want to immerse themselves in while they're in Tzfat. Others, however, are looking for a different kind of vacation. They want to be in a rural area with wide open spaces, expansive views and a feeling of village life. For those visitors, The Bernstein House, located in the northern Tzfat neighborhood of Neve Oranim/Ramat Razim is a perfect answer. The Bernstein House and Holiday apartment allows visitors to sit and relax in a comfortable and refreshing area while enjoying the breathtaking view of the Sea of Galilee below. The neighborhood is located along the windy road between Tzfat and Rosh Pinna , across the road from the famous health resort, Mitzpe HaYamim. The apartment is perfect for a couple or a small family. The bedroom is bright and airy, with a tastefully decorated bedroom for a couple. The windows look out onto the rolling Galilee hills, and a fresh cross breeze allows guests to take advantage of Israel's gentle northern winds. Air conditioning is available for the hottest weather, but the "natural" air conditioning of the area makes this hardly necessary. The Bernstein House has a large living room and dining room allowing guests the opportunity to sit together for meals and evening relaxation, with cable TV and a DVD available for guests' enjoyment. The kitchen is fully equipped, allowing guests the freedom to prepare their own meals and eat at their leisure. The apartment's balcony is its crowning glory, with lawn chairs and a table to sit at and overlook Lake Kinneret . The Jacuzzi is also located on the balcony, which is a treat for those who want to cool off while enjoying the view. Grocery stores, restaurants, coffee houses, a pharmacy, and all other necessities are located within a five-minute drive of the Bernstein House. The Bernstein House is an ideal vacation location for couples and small families, as well as business travelers looking for a quiet place for relaxation and concentration. The proprietress will be happy to arrange additional activities, including massages, holistic healing sessions, meals, private transportation, guided tours and recreation activities.